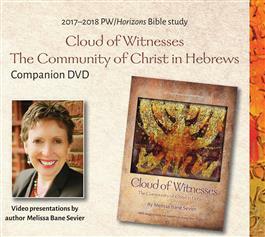 Welcome to the 2017û2018 PW/Horizons Bible study, Cloud of Witnesses: The Community of Christ in Hebrews by Melissa Bane Sevier. In nine lessons, the author invites us to explore major themes found in Hebrews, relate these themes to other parts of our faith tradition, and tie them together with the overarching motif of community. Join the hundreds of thousands of thoughtful Christians who will be sharing this study together in the coming months. See and hear these lessons introduced in nine videos that correspond to the lessons in the printed study. Here, the leader shares additional insights and poses questions for further consideration and reflection.